How do I choose the right orthopedic surgeon for me? You’re contemplating surgery to repair a bum shoulder or to replace a long-ailing knee. But you’ve never been to an orthopedic surgeon before. Thus far you’ve only tried physical therapy, to no avail. But this is a big deal; hopefully, it’s the beginning of getting back to being the old you. So, how do you go about finding the right surgeon that fits both your surgical needs and personality? Obviously, you need a surgeon who has extensive experience with your particular procedure. But how do you find the mix of the right bedside manner and surgical expertise? After all, this relationship will be more than something like removing an appendix. You can boil it down to a handful of questions. How much improvement can I expect from my surgery? Before you even have the procedure, is your surgeon already pulling back on the possible quality of the results? Ask for the degree or percentage of improvement in function or flexibility or other parameters you want to consider. This shouldn’t be a closely held secret, but open to discussion between the two of you. It’s very important that your orthopedic surgeon is board certified by the American Board of Orthopaedic Surgery. Not all surgeons are board certified. Certification is a process that demonstrates a surgeon’s commitment to professionalism, lifelong learning, and quality patient care. 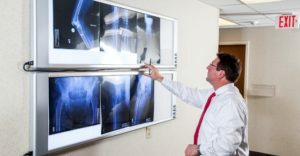 Board certified orthopedic surgeons have completed at least five years of residency training following medical school, and have met all ABOS standards. The two other associations of note are the American Association of Hip and Knee Surgeons and the American Medical Association. What are your other credentials? Is this potential surgeon a part of your insurance provider list? Most health insurance plans will punish you for straying off of their list of providers. Unless you have unlimited resources for far higher out-of-pocket costs, it’s best to limit your search to the group of orthopedic surgeons on your insurance provider list. Your GP or primary care physician is a good place to start. Ask if he or she has a list of orthopedic surgeons who specialize in the procedure you seek. From there, ask your physical therapist the same question. If any of your friends or associates have undergone the same procedure, say knee replacement, ask who performed the surgery and if they are satisfied with the outcome. Hospitals sometimes have what is called a “department of excellence for orthopedic surgery.” Check if your hospital has such a list. How experienced are you performing this particular surgery? You don’t want a surgeon who has just decided to add a new area of the body to his or her surgery options, but is thin on training and even thinner on experience. Are you familiar with the newest technology for this procedure? The world or orthopedic surgery is constantly evolving with new devices and new techniques. For instance, if you feel a certain style of shoulder replacement is what you need does your potential surgeon have experience with newer technologies, such as reverse total shoulder replacements? How long and how often will I need to return for follow-up appointments? Follow-up visits are necessary to see how your recovery is going and to gauge your progress on regaining flexibility and function. But there is a happy medium when it comes to these visits. Too many follow-up requirements can irritate patients, especially if the expectation comes after they have already had surgery and are recovering. Your surgeon should give you a timeline from your first consultation to your full recovery, along with what will be expected in between. Once you’ve narrowed down your list to just two or three, schedule a consultation with each surgeon. During these consultations, you’ll want to discuss your situation, ask any questions you may have, and get their opinion of what would work best for you. You’ll also want to get a feel if you like the surgeon’s bedside manner. You shouldn’t feel as if he or she is going through the motions and is rushing through the consultation. In the end, you’ll have a feeling that one or two surgeons are the right choice for your procedure. At that point, go ahead and schedule the initial appointment and get on with it. After all, the sooner you have the surgery, the sooner you’ll have your quality of life back. No one likes surprises, especially after undergoing surgery. If a common risk with shoulder arthroscopy is osteoarthritis, the patient needs to know, rather than feel it five years later and be surprised. Expect an honest discussion of the risks and potential complications of your proposed surgery.